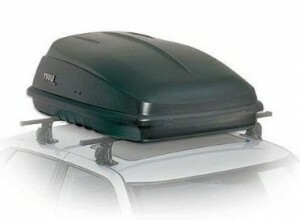 The Thule 667ES Excursion ES Car Top Carrier is the preferred choice for a multipurpose cargo box. This box has the ability to lug just about anything around. It has a 13 cu. ft. capacity and comes with standard, one key system locking mechanism that will reduce the headaches of having to scramble for multiple keys. This cargo box is perfect for anyone that consistently runs out of passenger space because their cargo is sitting in the seat next to them. It can carry a wide variety of things like, luggage, sports equipment, camping gear and a lot more. The 667ES is quite versatile and can mount on many different factory-installed and aftermarket roof racks. It comes with a rear opening. The box itself measures 55.5 x 18.2 x 35.2 inches and weighs 38 pounds. Thule is so confident about this product that it is backing it with a limited lifetime warranty. The warranty is voided if the purchaser should transfer the product to another person and it will not cover normal wear of the product: this includes accidents, scratches and cosmetic rust. UV and impact resistant. ABS constructed. Locking system is centralized for each closing and opening. One key locking system included with 13 cu. ft. capacity. Easy to mount and you’re on the road in minutes. Can mount to most factory installed and removable racks. 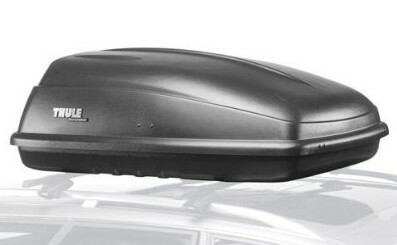 The Thule Excursion ES Rooftop Cargo Box was reviewed by 24 different customers. It had above average reviews and a lot of positive comments. Out of a possible 5 stars, the 667ES received 4 and a half. Though the product got good reviews overall, it seems that some felt the installation was quite easy while others felt it was a little challenging. The ones that found it easy to install said that it was light weight, yet durable. The directions that come with the package are easy to follow and very thorough. There are also pictures for those that don’t always like to read. This person that found it easy to install had help. Maybe an extra set of hands is all that is needed. The cargo box does what it says and that is carry a lot of stuff. Several reviewers had admitted packing it to its limit and reported nothing but praise for the product. One reviewer had packed 4 duffle bags. Another had packed 4 regular duffle bags as well, two razor scooters, blankets, a bag of cleaning supplies and a bag of stuff for a pool. That’s a lot of stuff. The locks help to secure everything, especially when the cargo box is fully loaded. Many didn’t only like the fact that it provided enough space, but it also kept their things dry and secure. There is a little strap inside the box that will allow you to secure things within. One person did mention that there are rubber dots within the box. They are used to cover up the remaining holes. If you forget to install this, you may open the box to find your things soaked. Do not forget this. All I gotta say is I’ve packed mine to the max many times and this thing is still going strong. It’s great.